A friend of mine is just as crazy as I am about fish tanks and other exotic pets. I called him this morning and asked if he would go up to the Wapsi River with me for some canoeing, exploring, and fishing. As we were unloading our gear we saw a Northern Water Snake hanging along the edge of the boat dock. 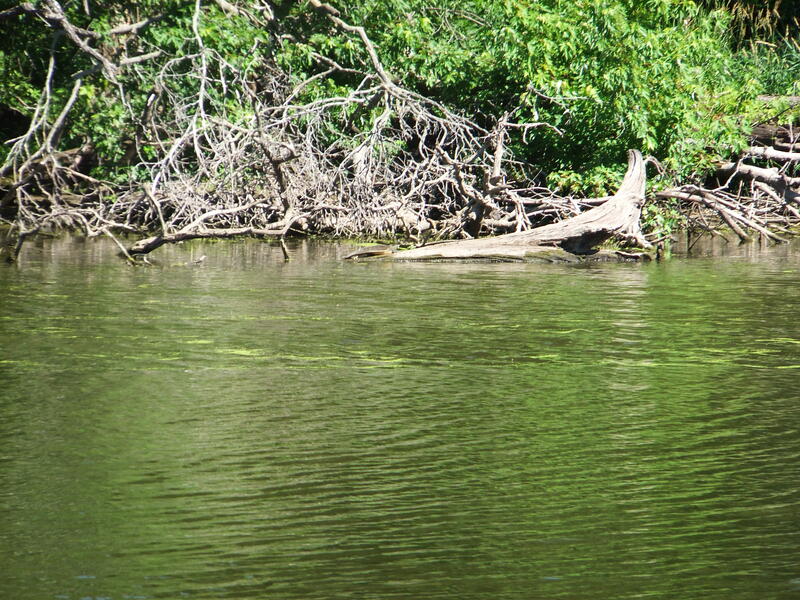 Across the river I could see a big Softshell Turtle basking on a log. 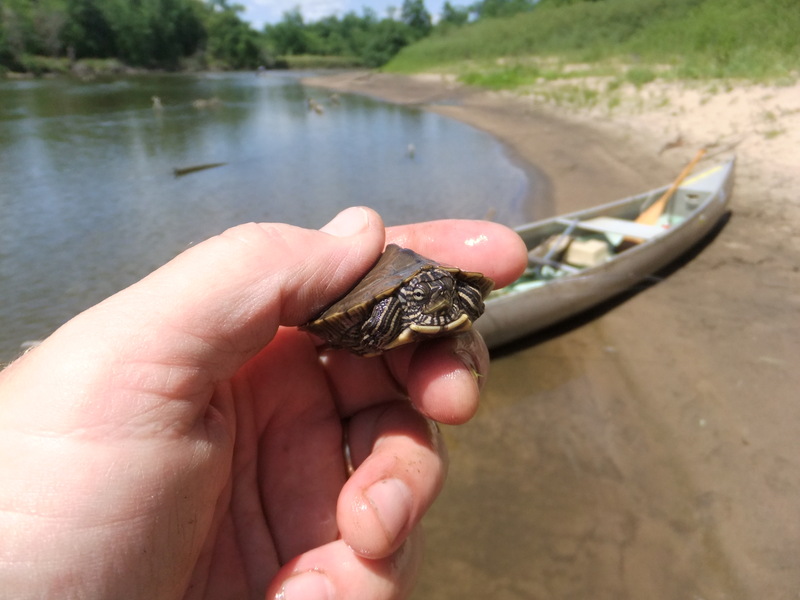 We canoed into the backwaters of the river and saw several Western Painted Turtles. When we got WAY back into the backwaters the water was still and clear. Frogs were jumping everywhere, and under water we could see huge Bullfrog tadpoles. 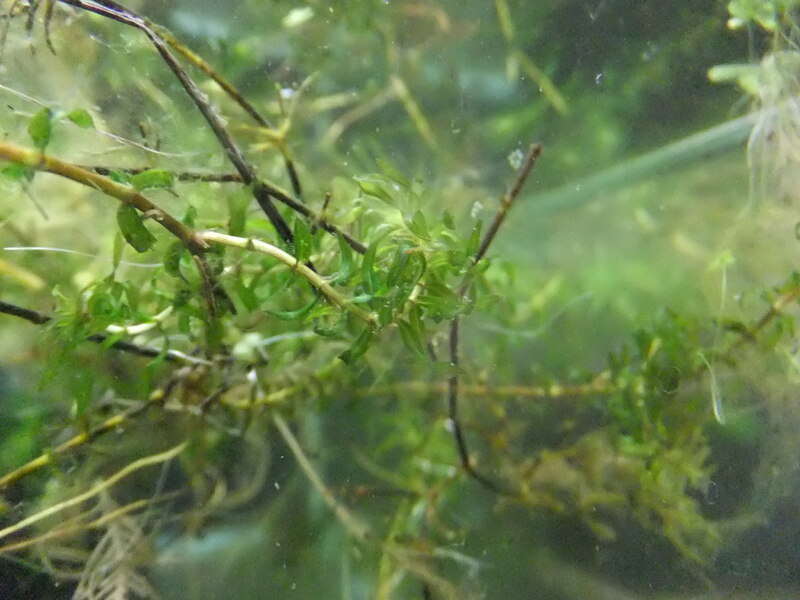 We noticed two varieties of aquatic plants, Hornwort and Anacharis, and collected a little for our home tanks. One of my main goals for the day was to find some interesting driftwood to use in my 55 gallon aquarium that will house the baby Red-eared Sliders. It was fun to canoe in the backwaters. We had to duck under branches and maneuver the canoe around big tree trunks. We saw a Great Blue Heron and some small ducks. Big Carp would swirl in the shallow flats, stirring up the mud. We went back out to the main channel and, along the way, saw a baby Map Turtle basking on a small log. My friend leaned out of the front of the canoe with a big dip net, holding it underwater, while I paddled quietly and inched him closer and closer. He bumped the log and the little turtle dove right into the net. My friend wants to keep him for awhile and release him later this Summer. 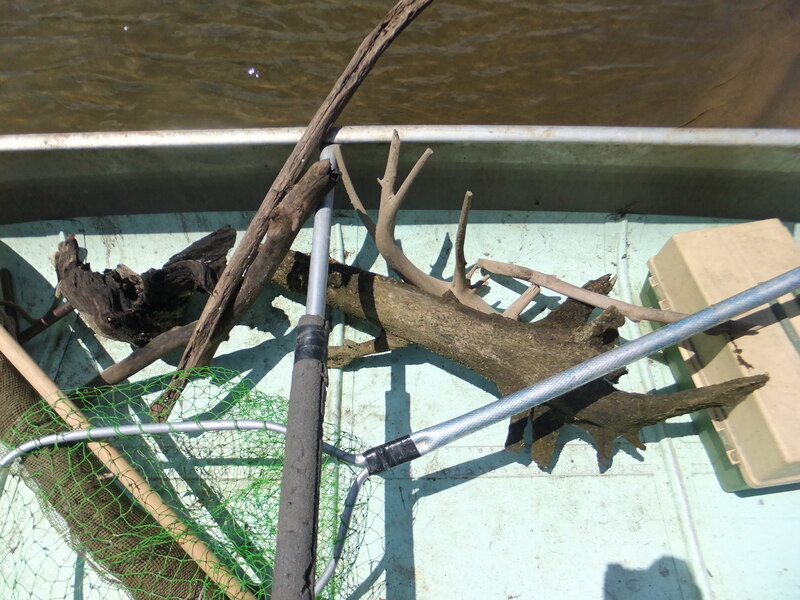 We made our way up to a large sandbar and I picked up some interesting driftwood pieces. 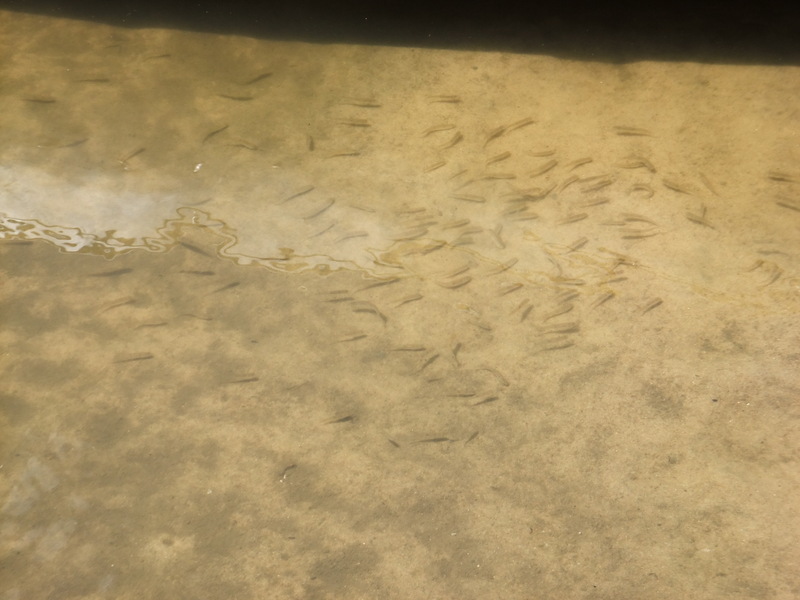 There were thousands of minnows schooling in the shallows. We found ourselves wandering. We went into the woods and found a little pond filled with hundreds of small frogs. They appeared to be juvenile Bullfrogs, but I think there were some other species as well. My friend would be searching in one direction and I would be off in the other direction. We had brought our fishing poles but hadn’t touched them. Off in the distance, my friend is walking along the sandbar, looking for….who knows! 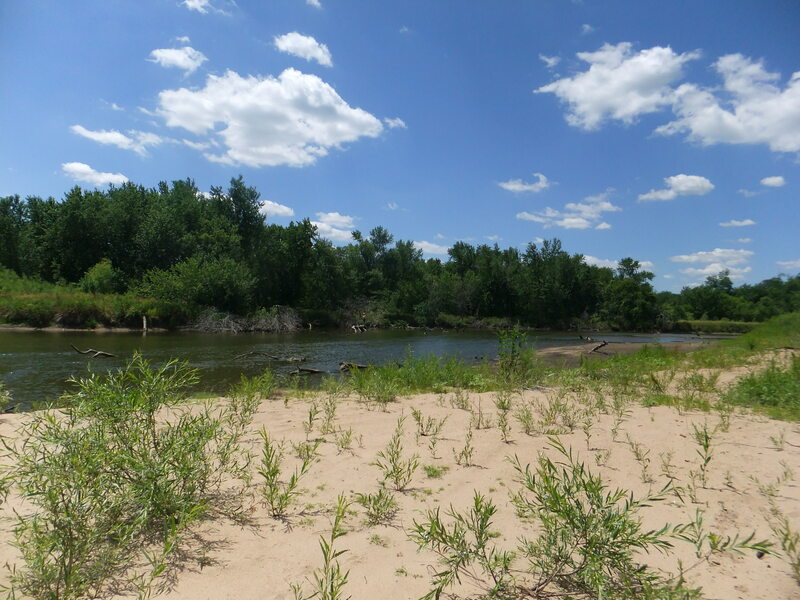 I ended up standing in the water and enjoying it so much that I swam across the river to another sandbar. Not very far at all, but the feel of the current and the cool water really put me in touch with reality. Then I came back to to where my canoe was. My friend had started fishing and had caught a young Largemouth Bass, maybe 6 or 7 inches long. As usual, the fishing looked better on the other side of the river, so I grabbed my fishing pole and swam toward an area of large downed trees. I stood up on a huge tree and watched a big Softshell Turtle come up for a breath. I made a few casts into the shaded areas against the shore and along the tree trunks. No luck, and I got snagged after a few minutes. I pulled on the line and the lure broke off. I watched a Watersnake swim right below me. Reluctantly, I climbed off the log and and went back to the sandbar. Out on the river, you can barely see me standing on a log where I was fishing…but not catching. 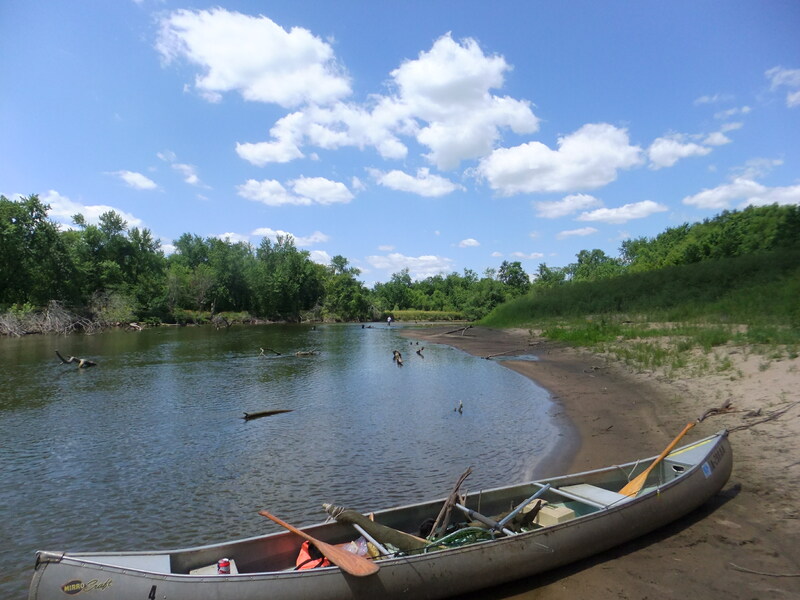 We left the sandbar and I acted as a human trolling motor for my friend as he fished along the driftwood, then the rocks, and finally along the boat docks as we returned to our starting point. He fished like a pro, putting the lure in some very fishy-looking locations but he didn’t catch any. I dropped him off at his house. 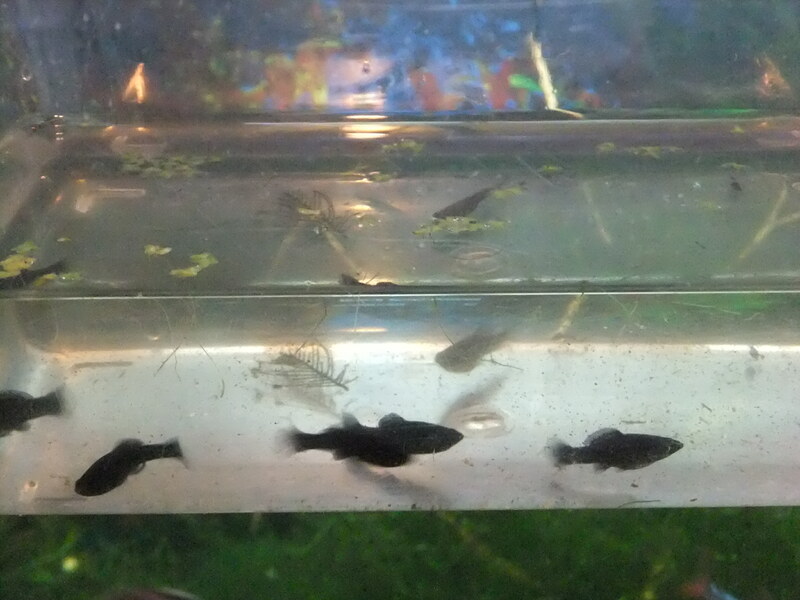 He had a very over-populated tank of Mollies. I don’t have any Black Mollies so he gave me some. 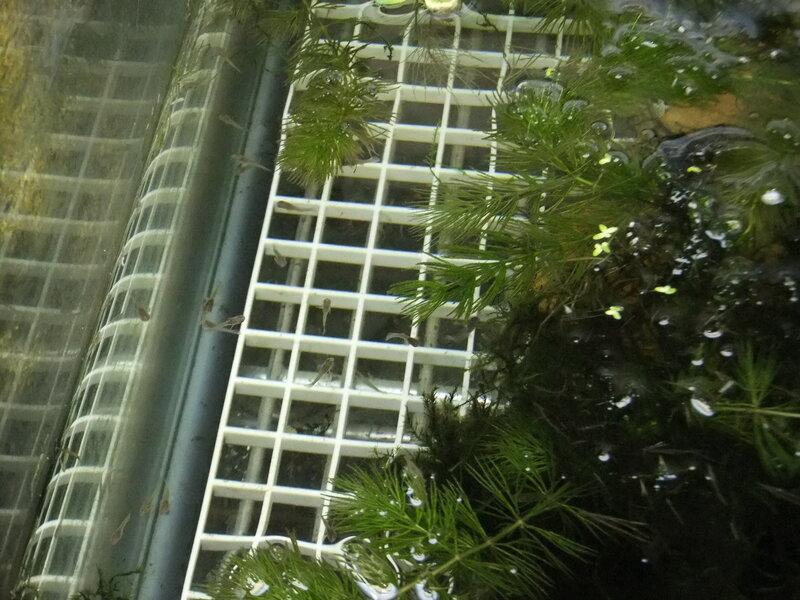 I washed off the aquatic plants and put them into a tank with some baby Swordtails. I’ll have to watch closely. There is a good chance some predatory aquatic insect larvae are in those plants. Baby Green Swordtails that were born a few days ago. All in all, we fished about an hour and explored for three hours. We had seen frogs, tadpoles, clams, crayfish, ducks,a heron, lots of little fish, snakes and turtles. On the way home both us were chattering about going back as soon as possible. I think I will give him one or two of my baby Red-ear Sliders and we can take that Map Turtle back to the river where he belongs. Thanks! I hope to set up the baby Turtle tank soon, I have to work some overtime at work this weekend dang it! Barely time to feed the fish and myself. Much better than I could describe. next time i go I’ll take more pictures AND bring an aquarium net so i can see some of the smaller life forms, the water beetles and also the smaller minnows.